As part of Singapore’s SkillsFuture initiative, I had the pleasure of talking about Human-Centered Design through the story of my seven and a half-year journey with OCBC Bank, and the lessons I learned there about how to make design work within a large corporation. The industry is changing at a fierce pace, and technological advances provide us with endless opportunities to disrupt markets. Blockchain, cryptocurrency, artificial intelligence (AI), virtual reality (VR) . . . The list of transformational tech topics goes on. 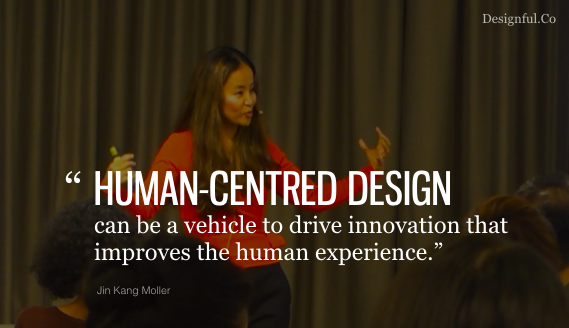 Does Human-Centered Design matter today? From an organizational development perspective, I do think Human-Centered Design (HCD) is even more relevant today than ever. As IDEO Lab’s recent article rightly pointed out, technology in itself is neither good nor bad. It’s how we apply it that matters. That’s why, moving forward, we’re going to need a group of people and organizations that advocate for the human experience—and human rights—as we develop these technologies. In my talk I shared three reasons why companies need to build HCD capability in the era of the innovation imperative. When technological trends distract us, keep calm and go back to the source of innovation: human needs. When we look deeper into people’s behavior and needs, we discover a host of ideas for innovation. By focusing on people’s needs, with the intent of enhancing the human experience, we are able to find meaningful solutions, and harness technology to innovate our processes. During my research on the topic of innovation and in my work with financial services institutions I have learned that there is a huge overlap between the notion of innovation and human-centered design. One of the most influential business thinkers, Peter Drucker, emphasizes that companies need to take a customer-first perspective to succeed with innovation. Scott D. Anthony’s The 28-Day Innovation Program in his highly acclaimed book is structured based on the high-level design process, such as discovering opportunites through consumer insights, blueprinting and test ideas. The book provides an exellent overview of innovation theories and actionable steps in developing innovation capabilites. It has reinforced my conviction that practising the human-centered design approach can itself help equip organizations with the right tools and the right mindset towards building innovation capabilities. The longer I practice HCD, the more evidence I see of how critical having the right mindset is. Having the right mindset raises the right questions, which leads organizations to solving the right problems. Practicing human-centered design provides a structured way to acquire a better focus on human needs at a deeper level. It is a learnable discipline that individuals and organizations can incorporate to make better decisions, to identify innovation opportunities and to execute these. However, a note of caution here. I’ve seen so-called ‘design thinking’ workshops that position design as a bunch of methods. I would like to stress that ‘design’ also requires a strong foundational education and years of practice, just as any other craft. I do believe though that it is still important to learn design as an approach to innovation, because learning and practising relevant methods can influence our thinking. Our new thinking then reshapes our mindsets, and this reshaping can then trigger powerful actions. And cultivating a human-centric design mindset, which in turn further reinforces proficiency in the use of the methods. Through this process, organizations acquire agility. The human-centered design process can be a vehicle to drive meaningful and sustainable innovation that improves the human experience. Here is a short clip of my talk on this topic. I thank the enthusiastic participants who shared their challenges and asked incisive questions during the session. If your organization is keen to learn more about Human Centered Design and to develop innovation capabilities, check out Advancing Innovation Through Human Centered Design, an executive program I designed, which is now available at SMU Academy, the professional training arm of Singapore Management University.